Edgar Valentine Odendaal (known as 'Val') has a God-given talent for art. He was born in 1944 in Nairobi and grew up in the wildlife paradise of the Kenyan bushveld. Val Odendaal is a self-taught artist with no formal art training. He has, however, developed his God-given gift to its present level. He started painting professionally in 1982 and uses various mediums; his favourite being oils. 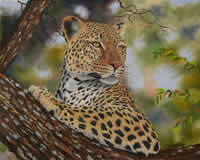 Accuracy and attention to detail are hallmarks of Val Odendaal's work. Val Odendaal and his wife Ethne live, at present, in the Mpumalanga Lowveld of South Africa, close to the Kruger National Park and many of the private nature reserves in the area. The sounds of the bushveld and seeing the African sunrise over the thorn trees every morning inspire him to continue with this passion. His work is known locally and internationally and his paintings are now widely collected throughout the world. They are to be seen in diplomatic offices, corporate and company boardrooms as well as in game lodges and private homes. All Val Odendaal's artworks are framed by the artist himself. He carefully selects the frame and mountings to suit each study and to display it to its maximum potential. He derives a deep satisfaction from seeing the creation through from its inception to its completion.